The National Alliance of People’s Movements (NAPM), one of India’s largest civil society networks, is all set to begin a nation-wide march, Samvidhan Samman Yatra, meant to protect the basic tenets of the country’s Constitution, starting on October 2 in Dandi, Gujarat, and ending on December 10 in Delhi. To be undertaken in three phases, the first phase from October 2 to October 15, would cover Gujarat, Rajasthan, Madhya Pradesh, Vidarbha and Gadchiroli areas of Maharashtra and Chhattisgarh, while the second phase would be from October 20 to November 5, covering the rest of Maharashtra, Goa, Karnataka, Kerala, Tamil Nadu, Andhra Pradesh and Telangana. The third phase, from November 11 December 10, would cover Jharkhand, Odisha, West Bengal, North Eastern states, Bihar, Uttar Pradesh, Uttarakhand, Himachal Pradesh, Punjab, Haryana and Delhi. Kashamir is proposed to be covered between first and second phases, an NAPM note says. People of any democracy are called upon to assert themselves once in a while. That assertion has to be more active than mere voting at elections. It has to ensure that the core values that we all cherish, those that the generations that fought for our freedom gave us through our Constitution are protected and nurtured to make the various pillars of democracy accountable to We The People. Over the past 70 years, our democracy, based on our Constitution, has survived numerous elections as well as social, economic and political upheavals and has managed to sustain to this day, despite being beseeched with numerous challenges. However, the last four years of the political journey and churning in this country has in numerous and fundamental ways shaken the ethos and fabric, which many of us probably took for granted as secure. In order to invisiblize its draconian, corporate-friendly, anti-people economic and political policy and to drown out popular awareness, questioning and resistance to the burning issues, the present Government and its ‘Parivar’ have used slogans, statements, diversion, obfuscation, brute force, troll armies, lynch-mobs etc. to misguide, dis-empower, attack, arrest, loot and even kill people, in particular Muslims and Dalits, repress farmers, workers, women, students and other sections, silence and jail (also shoot) academia, activists, writers, thinkers and anyone who dares question. All this, even as multi-crore scams kept surfacing, multi-millionaires keep fleecing and fleeing the country under the nose of the Govt and thousands of crores of loans waived off for large corporates. Every day has thus been and become an undeclared Emergency! The blood and bruises of our people in Mandsaur, Toothukoodi and elsewhere are fresh in our minds! It is indeed a time of alarming fascist onslaught with lawlessness and impunity! The agricultural distress is so overwhelming, the injustice against Dalits and Adivasis so gruesome, violence and mob-lynchings of Muslims so ubiquitous, the crackdown from primary education to universities and students so brazen, privatization of health, education, assault on reason and dissent and complete neglect and sell out of social sector, the persecution of women and transgender persons so atrocious, the big promises about jobs and black money so hollow, the supposedly big-bang attempts such as demonetisation and GST so upstartish and the attempts at destroying the pillars of democracy, our Constitution, our basic values and social fabric so systematic that, in spite of a pliant, sold out media and pressurised judiciary, the tide had to turn, and it has already started turning. The Vibrant Gujarat Model has Utterly Failed. It is now increasingly becoming clear that neither bribe nor bullet nor bullet train can silence people for too long or prevent the harsh reality from expressing itself. The challenge before all sane and sensible people and groups of this country is to be able to cohesively forge a spirit of coming together, fight for alternatives in a concerted manner to the destructive, divisive and distorted regime ruling us, ruining us. We have been witness to foul politics at play, bending democratic electoral processes and violation of constitutional norms in states of Uttarakhand, Manipur, Meghalaya, Delhi and Goa; subversion and hijacking of judicial processes, misuse of the investigating agencies and systematically eroding the credibility and legitimacy of every autonomous institutions in the country, even as every institution, every space is sought to be communalized. The once reliable public banking system is no more bankable, they have been looted of crores of rupees by white collar criminals who are now safely out of the country and are leading a life of luxury in foreign countries. The textbooks, syllabus and the plural history is being re-written to build a vicious Hindutva narrative and the seeds of lies, disbelief, disdain and enmity are being sowed. The progressive and people-oriented laws, enacted after decades of struggles by people’s movements whether on land, forests, environment, labour, right to information, anti-corruption, etc. are being amended to facilitate corporate loot, plunder of community resources and promote crony capitalism. The government is becoming the biggest violator of the parliamentary and constitutional democracy today and usurping the power, space of local governance bodies as well as smaller parties. We are standing at crossroads and passing through a critical juncture in India’s history and have a historical responsibility to save and salvage the ethos of this country, to fulfill the dreams of social, economic and political justice that Dr Baba Saheb Ambedkar envisioned. We all have an immediate responsibility to safeguard the constitutional values and principles of humanity, based on social justice, liberty, equality, fraternity, scientific and rational thinking in the social psyche to deal with all these political, economic, social, cultural challenges. The need of the hour is to create understanding and tolerance in society, by peaceful, democratic and constitutional means. It is equally vital to aim for economic equity, social parity, environmental protection, sustainable development, the establishment of people’s rights over access to resources and annihilation of caste and patriarchy. 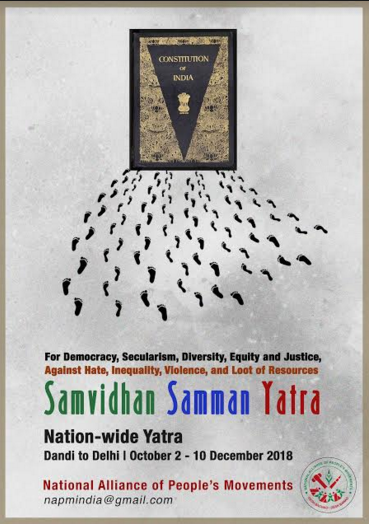 It is with this urgency and spirit that the NAPM has, after numerous discussions, planned a Samvidhan Samman Yatra – a nationwide tour to restore and protect the core values of our Constitution and democracy. The yatra shall commence on October 2, 2018 from Dandi, Gujarat, the place where Gandhi led his famous salt march in 1930. It will travel through various States in the country holding meetings, discussions, public events, supporting struggles, sharing the grief of victims of the violence and hate and spreading a message of plurality, love and peace and shall culminate in Jan Sansad in Delhi on 10th December 2018, the International Human Rights Day. Representatives of peoples’ movements, prominent activists, thinkers, academics, cultural activists, students and others will participate. We invite other comrades, sathis, movements, institutions, organizations and forums to come along with us and endorse the yatra. Everybody who subscribes to the core values of the yatra is welcome to participate either for the full period of the yatra as well partially.